Rice ‘N Roll, a new healthy concept by Lucy Chang. Providing you amazing summer rolls with all kinds of flavours: coriander, chicken, sambal, egg and many more. Together with an amazing team we created a brand new life and interior for Rice ‘n Roll Antwerp and Knokke. 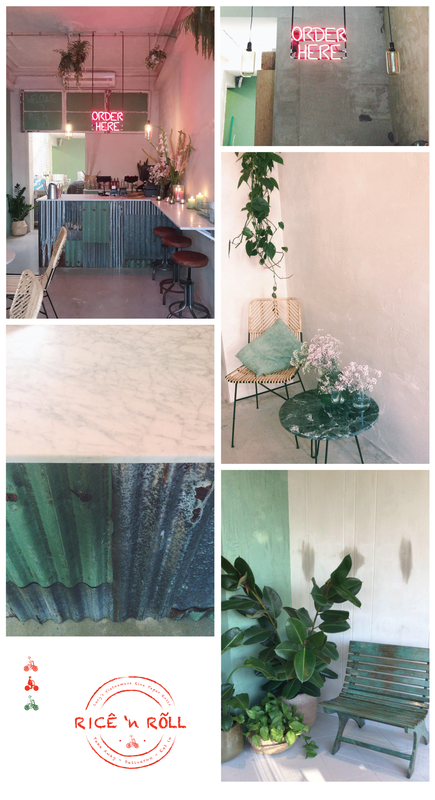 Using fresh green and ivory colors on the wall – green and rusty steel plates for the bar, finished with that beautiful white carrara marble – cognac leather benches in combination with raw wood and ofcourse our lovely neon sign to create that underground Vietnamese take away feeling. Finishing this project with a brand new logo and artwork.